• and a short dialogue/conversation with an additional memory game related to the dialogue. The central concept of this app allows two languages to be shown to the child at the same time so that the child can develop a weaker or unknown language with the support of their stronger or more well-known one. Currently, BilingoFun offers 6 languages: German, English, French, Mandarin, Korean and Cantonese. Two languages could be shown to the child at the same time to help children to develop the new language with the support of an already known language. The BilingoFun is now ready to be download on Google Play and Apple App Store. Please note that BilingoFun is currently not available in all countries. Come join Froshii on facebook to check out his latest travel and learning adventures. Learn 400+words and additional dialogues in 6 different languages. Can choose to display 2 languages at a time. Engaging and interactive games help motivate the child to learn. 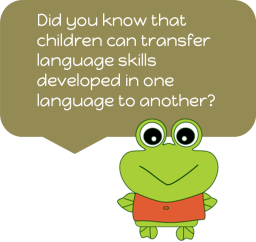 Did you know that children can transfer language skills developed in one language to another? BilingoFun applies a new concept that helps multilingual children develop their weaker or a new language with the help of the stronger one by presenting both languages to them simultaneously. Sometimes it is not easy to learn/understand a simple word such as “Thank you” in a new language by just looking at the picture. The illustration shown below is a good example. 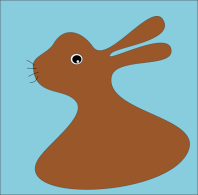 Is this a rabbit or a duck? BilingoFun does not only display the language being learned, but also a language that is already known by the child. In this case, the known language can support the learning of the new language and can, therefore, help the child avoiding misinterpretation misinterpreting of the picture. With the dual language technique, BilingoFun makes learning conversations easy for your child. Did you know that a new word needs to be exposed 15-20 times before one learns it? BilingoFun repeatedly displays and plays the sound of the words while the child interacts with the game objects. Therefore, it helps them to commit the words in their memory. Games in BilingoFun are easy to learn so that the child will not be overwhelmed and distracted when learning how to play the game. Thus, they can spend more time learning the language itself.